The American Journal of Obstetrics and Gynecology has just published a “Report of Major Impact” that demonstrates that electronic fetal monitoring saves lives. The corrected early neonatal, late neonatal, postneonatal, and infant mortality rates for all subjects were 0.9, 0.5, 1.7, and 3.1 per 1000 births, respectively… The risk of corrected mortality rate was different between those with vs without EFM during the early neonatal period (0.8 vs 1.7 per 1000 births, respectively; P ‹ .001), but not in late (0.5 vs 0.6; P ‹ .402) or postneonatal periods (1.7 vs 1.8; P ‹ .296). In other words, EFM cut the rate of early neonatal death in half (death from birth to 7 days), but had no impact on late neonatal death (from 7-28 days of life) or postneonatal death (from 1 month to 1 year of age). This is exactly what you would expect to find if EFM prevents peripartum death from hypoxia (lack of oxygen). The results are represented graphically below. What are the differences between this study and the Cochrane review that purported to show that EFM increases operative delivery rates without improving neonatal survival? The Cochrane review, encompassing 37,000 women, was simply too small. Moreover, as the Cochrane review authors themselves noted, of the 12 RCTs included in the analysis, only 2 were high quality studies. 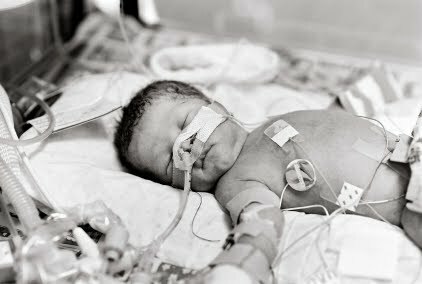 According to the Cochrane review and the most recent ACOG recommendation, the use of fetal heart rate monitoring increases operative delivery rate without a concomitant decrease in longterm neonatal outcomes. Thus, understandably there has been continued angst about using fetal heart rate monitoring during labor. The main implication of our study is that now there is reassuring evidence for the use of EFM; its use is linked with … a significant decrease in early neonatal and infant mortality … [F]etal heart rate monitoring can be used in daily practice with some assurance. Of note, this study, which contains only live births, almost certainly underestimates the benefit of EFM. EFM appears to save lives by decreasing the risks of hypoxic brain injuries associated with low Apgar scores (‹4). 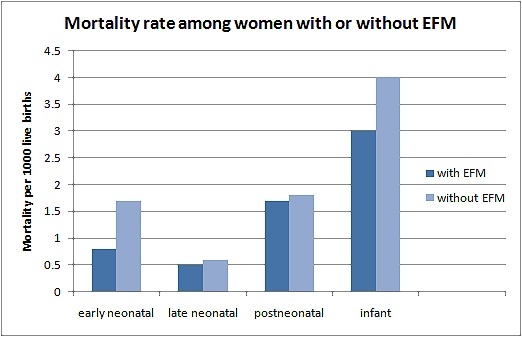 The study did not include intrapartum deaths (Apgar 0), where the benefits of EFM are similar or even larger. The bottom line is that the largest study of electronic fetal monitoring to date shows that EFM cuts the rate of early neonatal death in half. That is a dramatic benefit.